William (Bill) L. Daly was named the National Hockey League’s first-ever Deputy Commissioner by Commissioner Gary B. Bettman on July 22, 2005 — an appointment that was unanimously endorsed by the NHL’s Board of Governors. Daly’s appointment came after serving for more than eight years as the League’s Chief Legal Officer, during which time he played a major role in helping to shape the National Hockey League’s identity on the global sports landscape. In his current role, Mr. Daly is the chief consultant to Commissioner Bettman on virtually every issue impacting the League’s operation and business. Principal among Mr. Daly’s duties is his lead role in negotiating and administering the League’s collective bargaining agreements with the NHL Players’ Association and with the NHL Officials’ Association. In 2004-05, he was a central figure in the League’s collective bargaining negotiations with the Players’ Association, which resulted in a new Agreement that effectuated a revolutionary change to the League’s economic operating system. That Agreement, which many view as one of the most forward-thinking in all of professional sports, laid a strong foundation for the successful re-launch of the NHL’s business in 2005-06. In addition to his continued oversight of the NHL’s legal departments, Mr. Daly is also responsible for many areas of the League’s business, including its broadcast and new media initiatives, special events and NHL International. 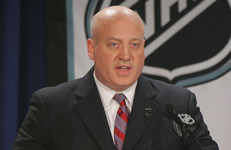 Soon after the Collective Bargaining Agreement was concluded in the summer of 2005, he was the chief negotiator of the NHL’s national cable television agreement with Versus (formerly OLN). Following that, he oversaw the NHL’s negotiation of a new international television distribution arrangement with the North American Sports Network (now known as ESPN America). Most recently, Mr. Daly played a leading role in negotiating multi-year extensions to the League’s existing national broadcast relationships in Canada with each of CBC (Canadian Broadcasting Corporation), TSN (The Sports Network) and RDS, and on broadcast TV in the United States with NBC.